Located 10 minutes by boat from Motu Mute Airport, Bora Bora Resort and Spa offers luxury accommodation on 17 acres of waterfront. Boasting stunning views of Mount Otemanu, the resort is set on the shores of a picture-perfect lagoon and makes the most of the unspoilt coral reefs. Enjoying an outstanding range of onsite facilities, the resort features Polynesian style décor and timber architecture as well as a wealth of little luxuries including private hot tubs, private pools and direct access to the turquoise lagoon. 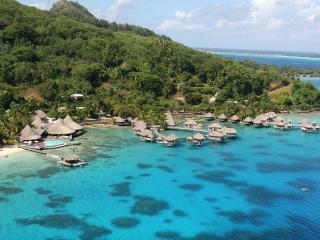 Located 30 minutes by boat from Motu Mute Airport, Conrad Bora Bora Nui offers deluxe villa accommodation overlooking a spectacular turquoise lagoon. Featuring luxury accommodation, the resort offers overwater options with lagoon views, wooden floors and marble bathrooms. Home to an outstanding range of onsite facilities, the resort also offers some rooms with their own private plunge pool and spa bath and glass floor panels, offering a unique perspective on the crystal ocean below. 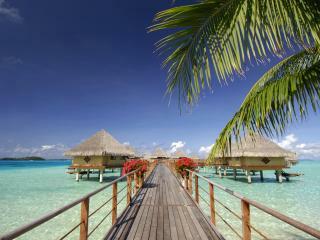 Hotel Maitai Polynesia offers great value for those wanting to experience the magical Bora Bora region of Tahiti. Within a short walk you can discover a number of local beaches and lagoons. This Tahiti accommodation features a range of room types from garden rooms to over-water bungalows, as well as a number of resort facilities including restaurant & bar, swimming pool and free WiFi throughout the resort. 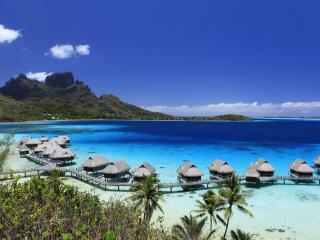 Hotel Maitai Polynesia is a great option for your next Tahiti holiday. Located on Motu Piti Aau on an exclusive private beach, InterContinental Bora Bora Resort and Thalasso Spa offers 5 star accommodation within minutes of the airport. The resort offers luxury villas suspended above the crystal waters of the turquoise lagoon and enjoy large sun terraces, picturesque views of Bora Bora and glass-bottom coffee tables, for a unique perspective on the marine life below. Enjoying direct access to the pristine lagoon, the resort also offers a fantastic range of onsite facilities and activities and is close top Bora Bora Photo Lagoon, Le Meridien Beach, Moti Piti Aau Beach and Mt Hue. Located on Matira Beach on the main island, InterContinental Bora Bora Le Moana Resort offers unique, luxury overwater accommodation in a romantic and intimate atmosphere. Just minutes from the airport, the resort offers a true Polynesian experience, a traditional way of living and spectacular sunsets. The beachfront accommodation enjoys exclusive access to a private white sand beach, is home to an outstanding range of onsite facilities and is close to a variety of popular local attractions. 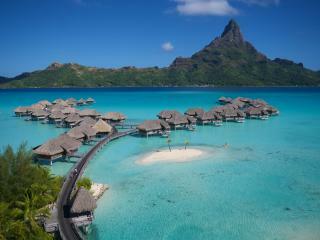 Sofitel Bora Bora Marara Beach Resort was initially built to host the cast and crew from the movie 'Hurricane' and remains a popular destination for Tahiti travellers to the beautiful Bora Bora. Choose from a number of bungalow types including overwater bungalows, and enjoy the sea vistas from the poolside Hurricane Bar. 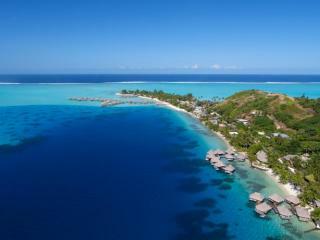 With a range of resort facilities and a great lagoon location, Sofitel Bora Bora Marara Beach Resort is an ideal choice for your next Bora Bora holiday. 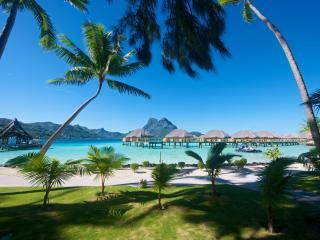 World-class service awaits you at Sofitel Bora Bora Private Island. Located in the Society Islands archipelago of French Polynesia and only 2 minutes from boat ride from Bora Bora's main island, this small boutique island resort is the perfect choice a luxurious and romantic Tahitian escape. With lush mountains and crystal clear waters as your backdrop, you won't be disappointed when you book your next holiday at Sofitel Bora Bora Private Island!